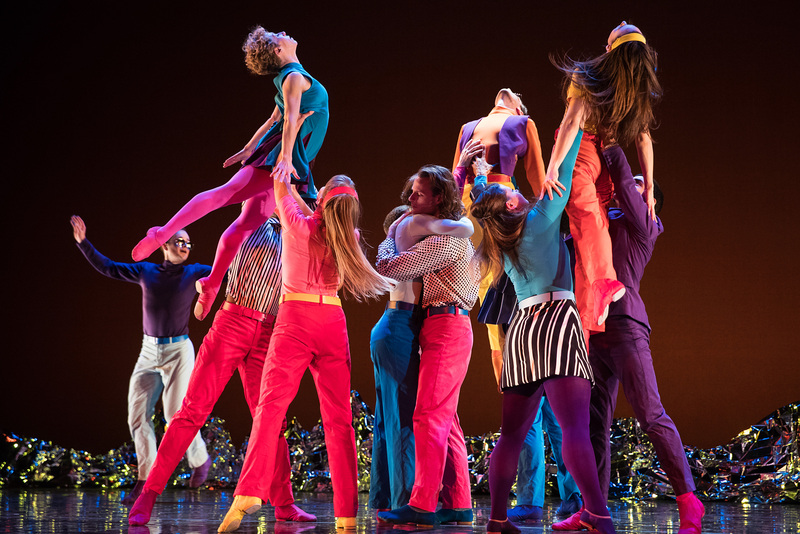 Mark Morris’ Pepperland successfully launched Liverpool’s Sgt Pepper at 50 Festival in 2017 and this year it tours the UK, bringing its unique take on the classic album to new audiences. Inspired by the Beatles’ 1967 album Sgt Pepper’s Lonely Hearts Club Band, the production takes the well-known songs as its start point but then expands the music and dance into unexpected directions with new composition and choreography. The piece was actually commissioned on a slight misunderstanding because Doran was asking a number of artists to create pieces for individual tracks from the album – but Morris thought he was choreographing for the entire album. Working with composer Ethan Iverson, Morris created a piece with new arrangements of Beatles classics Sgt Pepper’s Lonely Hearts Club Band, With a Little Help From My Friends, A Day in the Life, When I’m Sixty-Four, Within You Without You and Penny Lane as well as original composition. “Every single person who lives in Greater Liverpool is related to or went to school with one of the Beatles so they are all experts in all things Beatles,” he laughs. “I was ‘I sure hope they like it – because if not I’ll hear about it! Armed with the album, long-term collaborators Morris and Iverson set about creating a show which would take the Beatles’ music and give it a new lease of life. Morris, who launched MMDG in 1980 and has created nearly 150 works for the company, ensures live music is at the heart of his work so it was imperative they didn’t just reproduce the album. “I do a lot of research on any score and Ethan also loves that so we went deeper into the history and the background of the influences,” recalls Morris. “Also the album itself is only 40 minutes long so we substantiated it with the music that Ethan wrote. So there’s new music within it and new ideas about music. Pepperland features a chamber music ensemble of voice, theremin, soprano sax, trombone and two keyboards. The production has been described as ‘witty’, ‘humorous’, ‘joyous’ and ‘eccentric’. And its sixties-influenced brightly coloured costumes created by Elizabeth Kurtzman ensure it’s an eye-catching tribute to the period in which the Beatles became international pop idols. Since being performed in Liverpool nearly two years ago, Pepperland has been staged across the United States of America and in Canada. And this month is in Cardiff at Wales Millennium Centre. Since its creation, Morris says Pepperland has needed little revision. Morris has been hailed as the ‘most successful and influential choreographer alive and indisputably the most musical’ by the New York Times. From 1988 to 1991, he was Director of Dance at the Théâtre Royal de la Monnaie in Brussels and in 1990 he founded the White Oak Dance Project with dancer, actor and choreographer Mikhail Baryshnikov. He has created works for more than 20 ballet companies worldwide and directed and choreographed productions for The Metropolitan Opera, New York City Opera, English National Opera and The Royal Opera, among others. With a career spanning 40 years and numerous tours of the UK, he has built up a firm following this side of the Atlantic.